It's December people and you know what that means? Snow, ice skating, Christmas trees and more! Why, it's finally time get all those lights, wreaths and ornaments out of storage. Don't forget to dust off that giant inflatable Santa Claus for the front lawn too. It's also time to lose what little common sense we have in public when there is money to be saved on unnecessary household goods. Best of all though, it's time to veg out on the couch with a mug of candy cane-flavoured hot chocolate while endless feel-good TV Christmas movies are playing on the tube. Watching TV Christmas movies from the likes of Hallmark and Lifetime has been a yearly pastime for me for a couple years now. They're cheesy, unoriginal, melodramatic, and sickeningly idealistic, but man are they entertaining. You just can't help but be impressed with the recipes that Hallmark and Lifetime have come up with. Combining B to C-level stars with familiar rom-com tropes and a slew of other possible elements, it's no wonder that you end up with what resembles that half-eaten panettone you forgot about in the pantry a couple of months after New Year's. Let me tell you, I honestly wouldn't have it any other way. Jessie Patterston (Arielle Kebbel) hasn't had much luck in her love life. After two engagements that failed, she's now on her third and is about to be married to Mike (Sage Brocklebank) who proposed to her during a basketball game, jumbotron and all. Her mother (Karen Kruper) who is understandably sick of it all, ignores Jessie's cold feet before the ceremony and pushes her to go through with the wedding. Will this be the day Jessie finally becomes a wife? How could Jessie (Arielle Kebbel) say no to this fistbumping gentleman (Sage Brocklebank) on the left? Well, surprise surprise. 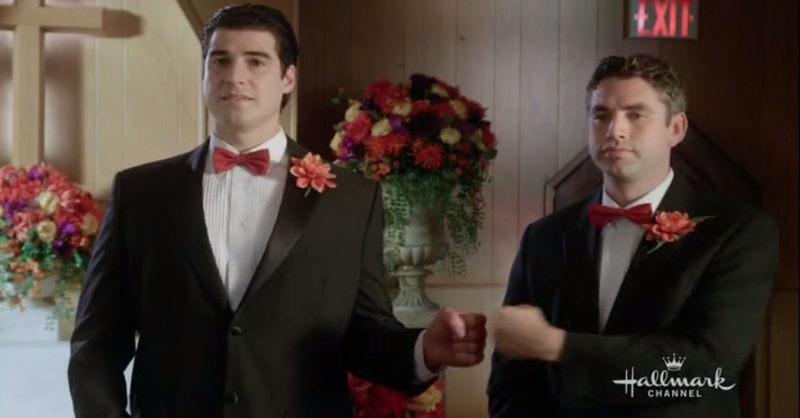 Jessie does not go through with the wedding and quickly escapes out the exit after making it all the way to a smiling and then dumbfounded Mike. So the question is, what exactly is wrong with Jessie? Why's she unable to commit to all these proposals that she initially accepts? Well, she has a hard time saying no apparently and she found it doubly hard to reject Mike during the initial proposal in front of 50,000 basketball fans which is actually pretty understandable if you ask me. Thing is, she's faced similar adversity before. Her first fiance who was a weatherman (Kyle Cassie) proposed to her during a live weather report with a million viewers watching. Her second fiance (Matt Bellefleur)? Well, since he was a movie critic, he proposed to her using the marquee of a movie theatre. You'd think that by now she'd be used to these ridiculous public proposals, but I guess not. As viewers, we're supposed to feel super bad for Jessie during her post-ceremony heart to heart with her sister Vivian (Kimberly Sustad), but no amount of bad acting and runny mascara is going to do that unfortunately. The thing is, we've seen this kind of movie before. How about How to Lose a Guy in 10 Days? How about The Runaway Bride? I guess we can safely say that Barbara Kymlicka has seen these movies before. Good for her I guess, but so many other people have as well, including me. So many of the storyline elements have been done to death before as well. Everything from the pushy parents to the friends and family giving advice to each side, there's just absolutely nothing new here. 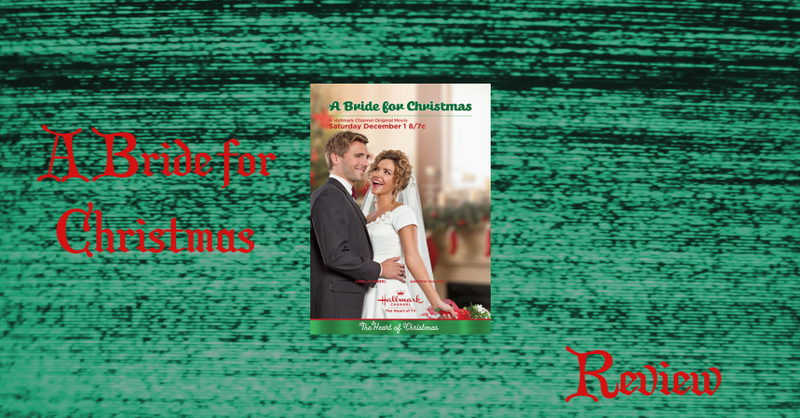 However, the biggest sin of A Bride for Christmas is its inability to build a convincing case for the romance that develops between Jessie and Aiden. Above this paragraph, you can see Aiden showing off his piano skills right after Jessie admits that she has a thing for Christmas carols as if it's this big personal secret. Jessie just watches in awe as Aiden plays "The First Noel," but trying not to look like she's in awe. It's the kind of scene that shows the level of restraint that the extras have since none of them burst out laughing like I did. The same goes for a later scene at the animal shelter that Jessie and Aiden are volunteering at. A man brings back a dog that he had adopted because it's too much trouble which prompts Aiden to try and convince him otherwise. All this while Jessie just stares on in absolute amazement which can actually be seen in the picture below. This scene culminates in a kiss between the two and let me tell you, it doesn't get much more forced than this. Any credibility that this movie had before this scene was just thrown out the window. A Bride for Christmas while not among the worst of Hallmark, is pretty down there. It's never actually funny, it's pretty much never charming and its characters lack any true spark or differentiating factor that would make them memorable. That's not really Arielle Kebbel or Andrew W. Walker's fault though. This falls on the writing. Sure, Kebbel shows some weakness when her character needs to show a bit of emotion, but I've seen worse. I've also seen better which I guess goes for the entire movie as well.